Mount St. Helens is an active volcano located in the United States' Pacific Northwest region. It is about 96 miles (154 km) south of Seattle, Washington and 50 miles (80 km) northeast of Portland, Oregon. Mount St. Helens is a part of the Cascade Mountain Range which runs from northern California through Washington and Oregon and into British Columbia, Canada. The range features many active volcanoes because it is a part of the Pacific ​Ring of Fire and the Cascadia Subduction Zone which has formed as a result of converging plates along the North American coast. Mount St. Helens' most recent period of eruptions lasted from 2004 to 2008, although its most devastating modern eruption occurred in 1980. On May 18 of that year, Mount St. Helens erupted, causing a debris avalanche which took off the top 1,300 feet of the mountain and destroyed the forest and cabins around it. 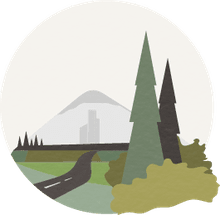 Today, the land surrounding Mount St. Helens is rebounding and most of it has been preserved as a part of the Mount St. Helens National Volcanic Monument. Compared to other volcanoes in the Cascades, Mount St. Helens is fairly young geologically speaking because it formed only 40,000 years ago. Its top cone that was destroyed in the 1980 eruption began forming only 2,200 years ago. Because of its quick growth, many scientists consider Mount St. Helens the most active volcano in the Cascades within the last 10,000 years. There are also three main river systems in the vicinity of Mount St. Helens. These rivers include the Toutle, Kalama and Lewis Rivers. This is significant because the rivers (especially the Toutle River) were impacted in its eruption. The nearest town to Mount St. Helens is Cougar, Washington, which is around 11 miles (18 km) from the mountain. The rest of the area is surrounded by the Gifford Pinchot National Forest. Castle Rock, Longview, and Kelso, Washington were also affected by the 1980 eruption however because they are low-lying and near the region's rivers. The nearest main highway in and out of the area is State Route 504 (also called the Spirit Lake Memorial Highway) which connects with Interstate 5. As previously mentioned, the most recent large eruption of Mount St. Helens took place in May of 1980. Activity on the mountain began on March 20, 1980, when a magnitude 4.2 earthquake struck. Shortly thereafter, steam began to vent from the mountain and by April, the north side of Mount St. Helens began to grow a bulge. Another earthquake struck on May 18 which caused a debris avalanche that wiped out the entire north face of the mountain. It is believed that this was the largest debris avalanche in history. Following the avalanche, Mount St. Helens eventually erupted and its pyroclastic flow leveled the surrounding forest and any buildings in the area. Over 230 square miles (500 sq km) was within the "blast zone" and was affected by the eruption. The heat from Mount St. Helens' eruption and the force of its debris avalanche on its northern side caused the ice and snow on the mountain to melt which formed volcanic mudflows called lahars. These lahars then poured into the surrounding rivers (the Toutle and Cowlitz in particular) and led to the flooding of many different areas. Material from Mount St. Helens was also found 17 miles (27 km) south, in the Columbia River along the Oregon-Washington border. Another problem associated with Mount St. Helens' 1980 eruption was the ash it generated. During its eruption, the plume of ash rose as high as 16 miles (27 km) and quickly moved east to eventually spread around the world. The eruption of Mount St. Helens killed 57 people, damaged and destroyed 200 homes, wiped out the forest and popular Spirit Lake and killed around 7,000 animals. It also damaged highways and railroads. Although the most significant eruption of Mount St. Helens occurred in May of 1980, activity on the mountain continued until 1986 as a lava dome began forming in the newly formed crater at its summit. During this time, many small eruptions occurred. Following those events from 1989 to 1991, Mount St. Helens continued erupting ash. What was once an area that was completely scorched and knocked down by the eruption is today a thriving forest. Just five years after the eruption, surviving plants were able to sprout through the build-up of ash and debris. Since 1995, there has been a growth in the variety of plates within the disturbed area and today, there are many trees and shrubs growing successfully. Animals have also returned to the region and it is again growing to be a diverse natural environment. Despite these rebounds, Mount St. Helens continues to make its presence known in the region. From 2004 to 2008, the mountain was again very active and several eruptions occurred, although none were particularly severe. Most of these eruptions resulted in the building up of the lava dome on Mount St. Helens' summit crater. In 2005, however, Mount St. Helens erupted a 36,000 foot (11,000 m) plume of ash and steam. A minor earthquake accompanied this event. Since these events, ash and steam have been visible on the mountain several times in recent years. To learn more about Mount St. Helens today, read "Mountain Transformed" from National Geographic Magazine. Funk, McKenzie. (2010, May). "Mount St. Helens. 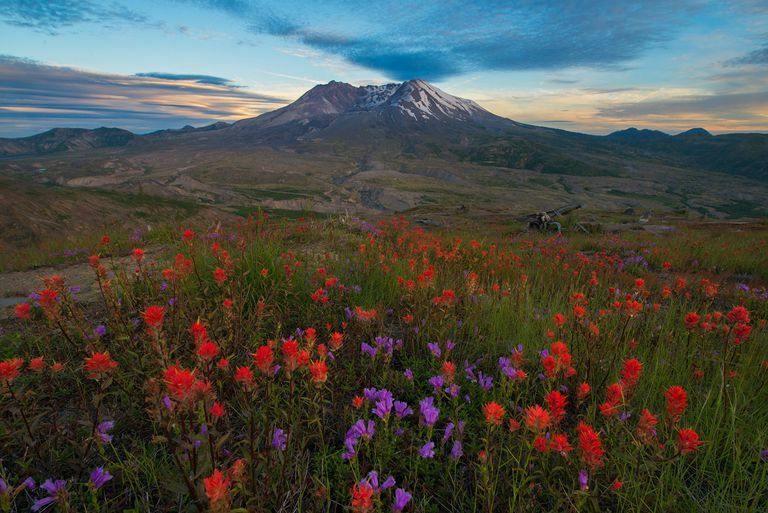 Mountain Transformed: Thirty Years After the Blast, Mount St. Helens Is Reborn Again." National Geographic. http://ngm.nationalgeographic.com/2010/05/mount-st-helens/funk-text/1. United States Forest Service. (2010, March 31). Mount St. Helens National Volcanic Monument. https://www.fs.usda.gov/giffordpinchot/. Wikipedia. (2010, April 27). Mount St. Helens - Wikipedia, the Free Encyclopedia. https://en.wikipedia.org/wiki/Mount_St._Helens.